7 Jun Filed under Brother Steven Visneau, Small Magazine. Happy Monday folks. 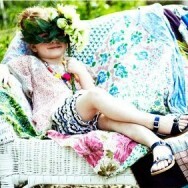 Oh, to lounge in the garden on a pile of pillows… I’m hoping for a garden party sort of week. Below, Brother Steve for Small Magazine. In a word, gorgeous. Bravo, brother!